BCCG #0007506574. See picture(s) for more details on condition of item. "DEREK JETER" NEW YORK YANKEES. "1993 Score Select" MLB Rookie Year Baseball Card #360. Rare Graded BCCG-10 (Mint or Better) by Beckett Grading Services "The World's Most Trusted Source in Collecting". We have been serving the hobby for 26 years. Our Mission: To Glorify God in all that we do as we serve collectors and dealers worldwide. BEFORE you checkout. We have been serving the hobby for 26 years. BEFORE you checkout. 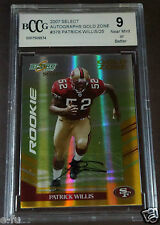 MINT CARD -- #/25 AUTO-- BCCG 10. Our Mission: To Glorify God in all that we do as we serve collectors and dealers worldwide. We have been serving the hobby for 26 years. Use our Checklist below to find more of your favorite players! 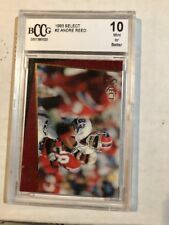 1993 Select Football Andre Reed Bccg 10. Mint Condition Like New. Shipped with USPS First Class Package. "DEREK JETER" NEW YORK YANKEES. "1993 Score - Select" MLB Rookie Year Baseball Card #360. Graded BCCG-9 (Near Mint or Better) by Beckett Grading Services "The World's Most Trusted Source in Collecting". J.J. Stokes. BCCG Mint 10. 1996 Select Certified. CARD NUMBER 39. You are bidding on a 2006-07 Topps Turkey Red Lamarcus Aldridge Rc Bccg 10 180 Card. Please refer to the picture for the condition of the card. This card are extremely hot! Get this card while you still can. If you have any questions please feel free to ask. Please feel free to check out my other auction for sale. Thanks and best of luck! 2017 #60 Ben Simmons 10 RC Rookie 76ers. We have been serving the hobby for 26 years. Our Mission: To Glorify God in all that we do as we serve collectors and dealers worldwide. Graded MINT or better 10 by Beckett (BCCG). 1996 Select Certified - Marvin Harrison RC. Y ou will receive exact card as seen in scan. Boxes will have peanuts for padding.